Working for the Royal Mail used to be something Stephen felt great pride in, carrying on the family tradition of his great-great-great uncle, Samuel Robertson. He had been a forthright gentleman, by all accounts. Stephen unlocked the curved door of the letterbox and removed the basket from its belly. In a few minutes, the hungry mouth that had swallowed thousands of letters for decades would be blocked up, probably forever. What a sad day. Reaching into the gloom, Steve ran his hand inside before locking it shut. ‘Just making sure,’ he thought, not really expecting to find anything. He opened it, hastily, furtively. It was addressed to him, but how could it be? Was he breaking the law, he wondered? He pulled out the single piece of paper, hands shaking. “As you ask, Samuel, mate, as you ask,” thought Stephen, driving away. Here’s my latest entry into Alistair’s Sunday Photo Fiction. He supplies us with his own wonderful photos, so deserves our support! Happy Sunday, all…. Do take part if you have time, or just pop over and read the other entries. Lovely. I wouldn’t dare decommission that letter box, oh no! Nice comment on the way public services are being trashed! Thank you, Patrick. I think great-great-great Uncle Samuel would make his feelings known…. Fabulous story! 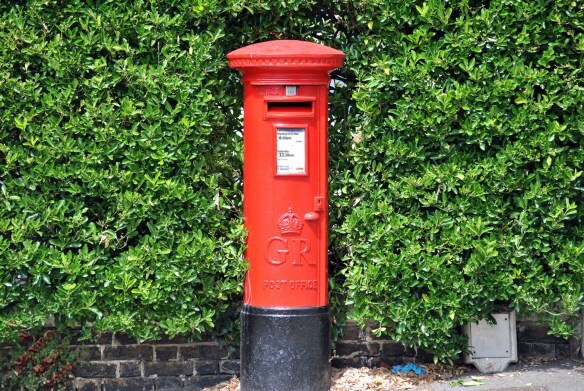 I hope Stephen and Samuel are able to beat the government and keep the postal box open! I think they will, somehow 🙂 Thank you! Wonderfully delightful interpretation of this – such fun with lovely nuances and possibilities!